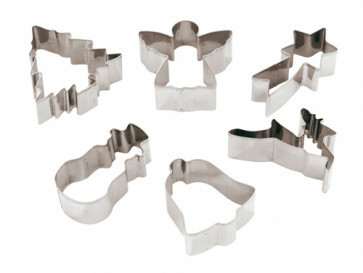 Set of paste-cutters with the shape of CHRISTMAS THREE, ANGEL, COMET STAR, REINDEER, BELL, SNOW-MAN, perfect to prepare biscuits, all soft doughs and salted ones, an alternative presentation of dishes. It allows to create and decorate easily and quickly. Completely in stainless steel it has dimensions of 8x8 cm. Height 3 cm.